Easily share your iPhotos™ with your Flickr™ friends. Before you upload to Flickr you can resize, rename, describe and tag your images with smart, Mail-style tokenfields - all directly out of iPhoto. 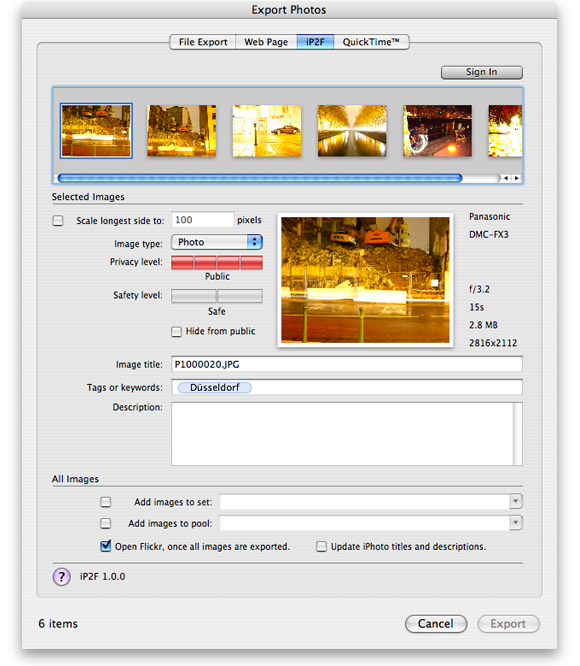 iP2F also lets you create photosets and add images to existing sets and pools. And of course your EXIF image meta data (camera model, exposure, etc.) is preserved. All that and more in one clean, easy to use and modern-looking plugin, which lives right in iPhoto's File > Export...-menu. But you don't have to take our word for it: Macworld gave iP2F 4 out of 5 mice.